These are two of my favorite videos of Max and Ben. Ben thought that Max needed help with his homework; Ben is on a campaign to be the boss of us all. 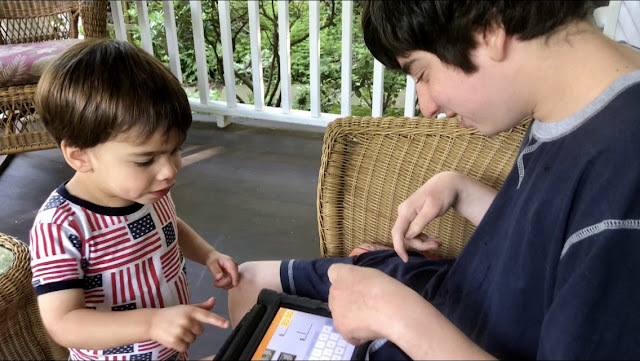 So he started to weigh in, and drew Max's finger to the iPad so Max could type the answer. (He uses the SnapType app, which enables users to upload a workpage then type or draw on it.) But then, Max had his say. I can see Ben starting to figure out that Max can use a little extra help here and there. And I can see Max making it clear that he knows what's up, he's got skills and he's the boss man. Aww, I love Max's giggle at the end! What has been very clear in Max's speech of late is that his voice is changing! So weird after following for several years. So true! I was watching a video from four years ago the other day and realized how deep his voice has gotten. This is what happens: they grow up! Omg! So sweet! I can’t believe how old Ben is! Evidently, I can still call him a toddler until he's 36 months old. I'm clinging to that!